Studio Rooms - Adults only Ground floor Studio apartments Spacious, comfortable, ground floor, Self contained with easy access. Queen Bed. Ensuite. TV/DVD. Air Con. Kitchen Facilities. Serviced daily. Sleeps up to 3 adults with single sofa bed. Cooked breakfasts available for purchase and delivered to your apartment. Larger ground floor studio apartment with queen bed and double sofa bed to accommodate up to 4 adults max. Balmoral Suites - Adults only 1st floor 1 bedroom apartments Spacious, comfortable, first floor, Self contained with great coastal views. King Bed. Ensuite. Lounge. Air Con. Kitchen Facilities. Serviced daily. Sleeps up to 4 adults with double sofa bed. TV/DVD. Table and chairs on balcony outside suite. Cooked breakfasts available for purchase and delivered to your apartment. 1 bedroom apartment on 1st floor with spectacular views down to East Coast. King bed and double sofa bed in lounge. Kitchen, walk-in shower in en-suite. Wi-fi hot spot in office. New outdoor litchen with BBQ, Pizza oven and coffee vending machine. Larger studio apartment on the ground floor with Queen bed and double sofa bed for up to 4 guests. Kitchen, bathroom with walk-in shower. 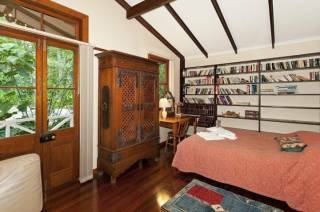 Spacious king bedded cottage with large spa. 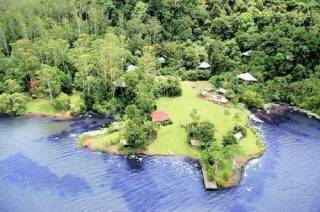 Spacious king bedded Cottage with large spa looking out into rain forest setting. Kitchen, en-suite with shower, cosy wood fire, private balcony. Clouds of Montville Cottages and Serviced Apartments are set on five acres of beautiful parklands overlooking Queensland’s Sunshine Coast! 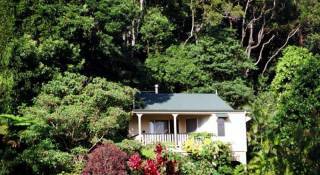 Clouds of Montville cottages and apartments lie in the heart of the Sunshine Coast Hinterland. This iconic region, just north of Brisbane, is renowned for the beauty and tranquility of its walks, parks and waterfalls. There is brilliant shopping, vibrant markets, wonderful restaurants and fresh local food to enjoy. The artistic heritage continues to flourish with world class artisans and galleries to amaze and discover. If you seek rejuvenation, reconnection and relaxation with someone special, a cottage at Clouds delivers that promise. Rediscover the romance and peace in your soul. Lost in the rainforest it’s time to slow down. Or if it is shopping and food and fun times with family and friends a self contained one bedroom apartment with great coastal views or a ground floor studio apartment will serve you well. Clouds of Montville, famous for the warmth of its welcome and wonderful service, is simply a beautiful place to stay in one of the world’s most beautiful places! Outdoor kitchen with BBQ, Pizza Oven and Cafe bar, Balinese style Dining Pavilion / Function, Par 3 Golf Course and room and Lawn Bowls rink. Our very own golf course and bowling green! At Clouds we have plenty of outdoor activities to occupy all types, all interests and all degrees of mobility and fitness. For those more active we have a par 3 golf course with 7 holes from 60m to 138m in length, there is also lawn bowls on our new all weather synthetic turn bowling green. Salt water pool in a tropical setting! When weather is right we have a delightful salt water pool set in the most idyllic tropical surrounds. At Clouds of Montville you have the chance to rejuvenate, reconnect and and simply relax poolside~ it’s time to slow down! Outdoor kitchen and Balinese style outdoor eating pavillion! The outdoor kitchen with BBQ, Pizza Oven and cafe bar is ideal for the hands on foodie types. To prepare food outdoors or in your own kitchenette and then toddle off to our Balinese style outdoor dining pavilion is a unique experience. Eating or just sitting, relaxing, having a drink, reading or chatting with others, this environment is very, very special indeed. Relax at Clouds or enjoy the many local attractions! Clouds of Montville is a boutique Eco Resort for adults only. 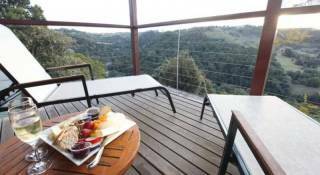 Comprising of five Cottages and four Serviced Apartments set on five acres of the most beautiful Hinterland parklands and looking down on the East Coast of Australia – Queensland’s Sunshine Coast. Sit back and relax or enjoy nearby shopping, markets, restaurants, art galleries, parks and waterfalls. CONDITIONS: Credit card details and a deposit payment of the first night are required to confirm your booking. Minimum nights stay applies to the Christmas and Easter breaks and all public holidays. Check in from 2pm. Check out by 10am. Your stay dates may be changed up to 2 weeks PRIOR TO check in at no cost. No refund will be made if your stay is cancelled WITHIN 2 weeks of check in unless we can re-book all nights cancelled. A $50 fee will apply to any refund. These conditions also apply to gift vouchers once a stay date has been confirmed. Sorry no visitors without prior permission from management. The facilities at Clouds are for the exclusive use of guests staying at Clouds. Smoking is restricted to outside areas, excluding balconies, outdoor kitchen and pool area. No children are allowed in the cottages. Due to the need to conserve wildlife no pets are allowed. No refund will be made if your stay is cancelled WITHIN 2 weeks of check in unless we can re-book all nights cancelled. 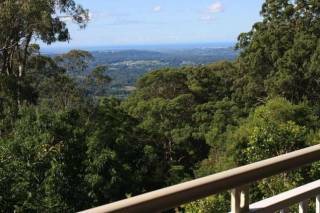 • Just 2.5km south of Montville on the road between Montville and Maleny. *GPS USERS: Please input Strong Court Montville which is the nearest cross street and is approximately 150m. from the entrance to Clouds. (Some GPS systems do not recognise Balmoral Road). • take the Bruce Highway north from Brisbane towards the Sunshine Coast. • exit onto the Glass House Mountains Tourist Drive/Steve Irwin Way. • travel 1km past Australia Zoo and turn left over the railway crossing into Landsborough. • follow this road through the roundabout and on up the range in the direction of Maleny. • at the top of the range take the right turn to Montville. Clouds of Montville are aprox. 9km from the turn-off on the left hand side. • take the Nambour Connection Road off the Bruce Highway. • follow the Blackall Range Tourist Drive signs up the range to Mapleton. • follow the main road through Flaxton and Montville. • you will find Clouds of Montville some 2.5km south of Montville on the main road on the right hand side. We have good road signage which is also headlight reflective at night.